AccuWeather Global Weather Center – April 12, 2019 – Winter officially has come and gone, but the flu season has tied a record for its length. Levels of flu-like illness in the United States have been at or above baseline for 20 weeks so far this season, tying the previous high of 20 weeks at or above the baseline set in 2014-15, according to the Centers for Disease Control and Prevention (CDC). The percentage of outpatient visits to health care providers for influenza-like illness (ILI) still remains above the national baseline of 2.2%, according to a CDC report that will be issued Friday. The flu season typically begins in October and lasts well into March. 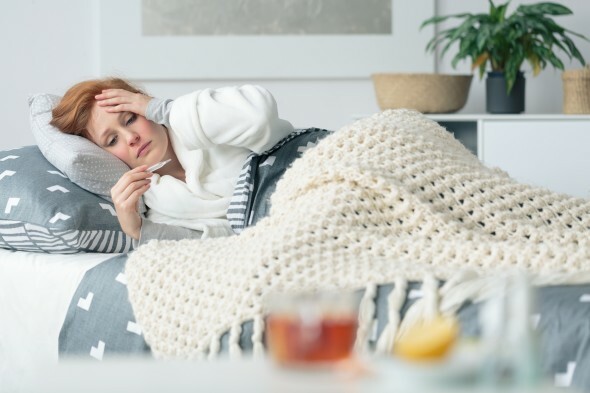 The report will indicate that flu activity continues to decrease; however, activity levels are still relatively high for this time of year, with 20 states continuing to report "widespread" flu activity. The four states experiencing high ILI activity are Louisiana, Missouri, South Carolina, and Virginia. The CDC estimates there have been between 452,000-549,000 flu hospitalizations and 30,600-50,900 deaths so far this season from October 1, 2018 until March 30, 2019. While that is a large range, this uncertainty could be trimmed moving forward. "AccuWeather believes the weather and the sunshine intensity is an important factor in the flu season; there is no flu to speak of in the summer because the sun is strong and the weather is warm," the company's founder and CEO Dr. Joel N. Meyers said. There is also no real flu season in the tropics. “There is a lot of evidence that suggests low humidity and low temperatures allow the influenza virus to survive longer, which promotes its transmission,” University of Virginia research associate professor Bryan Lewis wrote to AccuWeather, which has a partnership with the Biocomplexity Institute & Initiative at Virginia. AccuWeather, recognized and documented as the most accurate source of weather forecasts and warnings in the world has saved tens of thousands of lives, prevented hundreds of thousands of injuries and tens of billions of dollars in property damage. With global headquarters in State College, PA and other offices around the world, AccuWeather serves more than 1.5 billion people daily to help them plan their lives and get more out of their day through radio, television, newspapers, smart phones, tablets, connected TVs, the AccuWeather Network and AccuWeather.com. Additionally, AccuWeather produces and distributes news, weather content, and video for more than 180,000 third-party websites. Among AccuWeather’s many innovative and award-winning features available free to the public are MinuteCast® Minute by Minute™ forecasts with Superior Accuracy™. Furthermore, AccuWeather serves more than half of the Fortune 500 companies and thousands of businesses globally. Dr. Joel N. Myers, Founder and Chief Executive Officer, established AccuWeather in 1962 and is considered the "father of modern commercial meteorology." Dr. Myers, a leading creative thinker and visionary, has been named "the most accurate man in weather" by The New York Times and one of the top entrepreneurs in American history by Entrepreneur’s Encyclopedia of Entrepreneurs. AccuWeather™, AccuWeather RealImpact™, AccuWeather RI™, AccuWeather MinuteCast®, Minute by Minute™ and Superior Accuracy™ are all trademarks of AccuWeather, Inc.